When I spend the winter in southern Arizona, I fall into a quiet routine of daily uneventful living. It is a lot easier to document when I’m traveling, visiting new and interesting places, and experiencing adventure as I explore the highways across our land. I was surprised at the length of time since my last post and decided to write something no matter how simple the story turned out. The main reason I decided to update was to tell about a new addition to my rig. 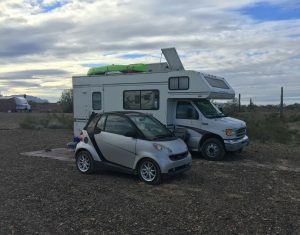 In the last episode I wrote about the little car I added to my lifestyle. The Smart car is working out well and I’m glad I made the jump from motorcycle to car. When you turn 70 years old, everything seems easier on four wheels instead of two. My only regret is that my little car only seats two, so when I’m hanging out with Richard and Dianna, whenever we all want to go someplace, they always have to drive. After solving the situation of supplemental transportation, I started to ponder an upgrade to the electrical system in Minnie. For the last few years my batteries have slowly lost much of there power. It was getting so bad that I could hardly get through the night on a full charge. All batteries will degrade over time but I have to admit that I didn’t take the best of care with mine. I mixed types and capacities – which you are never supposed to do – and through the use of inadequate equipment, never charged them to a point that removes deposits and extends their life. After pondering the choice between buying new lead acid batteries or taking the plunge and going with newer technology, I decided to go with newer technology and switch to lithium. Lithium batteries last a lot longer than lead acid batteries, they have a greater usable capacity, they weigh much less than other batteries, and best of all, they require basically no maintenance. The only drawback, and this is a big one, they are way more expensive. I figured that a lithium battery would probably last as long as I’m physically able to live this lifestyle, so I took the plunge and bought one. 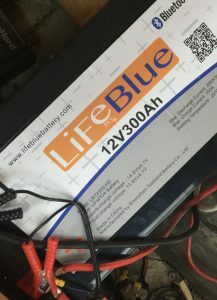 The battery I bought is called Lifeblue. 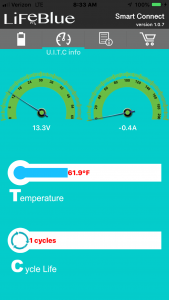 It gets its name from the chemical composition (LiFePo4) and the battery monitor system sent to your phone through Bluetooth. So far through testing I have used only a small amount of the 300 Amphours capacity. Through normal usage, the daily power I use would almost drain my old batteries. The new Lifeblue shows 75% of power still available. They could have put these all on one screen. 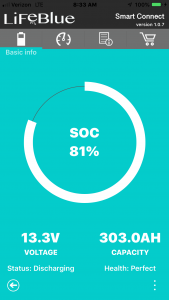 One problem I foresee is that I may not have enough solar to replace all the juice I use. Here in the desert southwest, the sun is low in the sky and we have had many cloudy overcast days. I tilted two of my panels on Minnie’s roof to help capture more sunlight, but the future forecast is for several days of cloudy weather. I way more prefer to use free sunlight to charge, but some generator time could be in our future. I have been hanging out here at the LTVA with Richard and Dianna. Richard drove me all the way to Yuma to pick up my battery and helped me install it in Minnie. Both Richard and Dianna have done so much for me and I can’t thank them enough. It has been wonderful spending time with them here in Quartzsite. Good investment, but now it looks like you may need to add another solar panel! Ahhh shucks! We love spending time with you in our chosen lifestyle. I’m so grateful to have a walking partner!! I think you made a wise decision. The upfront money will recoup itself over time, and the convenience will far outweigh that initial investment. So great to learn about newer technology.